Fletch He’s an investigative reporter whose methods are a little unorthodox. Currently he’s living on the beach with the strung-out trying to find to the source of the drugs they live for. Fletch He’s taking more than a little flack from his editor. She doesn’t appreciate his style. Or the expense account items he’s racking up. Or his definition of the word deadline. Or the divorce lawyers who keep showing up at the office. 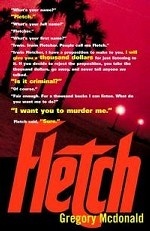 Fletch So when multimillionaire Alan Stanwyk offers Fletch the job of a lifetime, which could be worth a fortune, he’s intrigued and decides to do a little investigation. What he discovers is that the proposition is anything but what it seems.